Hi there! At the beginning of August, I noted the huge ground cracks at our lovely little Bee Ranch. I was hand watering my garden and thought I’d drop some water into one of the cracks to see if it’d fill up a bit of land and after about 30 seconds, I gave up. No water filling up at all. It was sort of sad to see the land like that again – even though it’s sort of typical for August in South Texas, it’s still hard to see things drying up so badly. Anyway, here we are approaching the end of the month and we have now had about 16 inches of rain (give or take a few inches as I’ve lost track of the rainfall). We keep thinking, “what a weird August we are having!” But we are not complaining. It’s just different. Sales at the Bee Ranch on the two mornings we are open to the public have been awesome and make us super happy we decided to focus our energies to increasing traffic here instead of out and about. 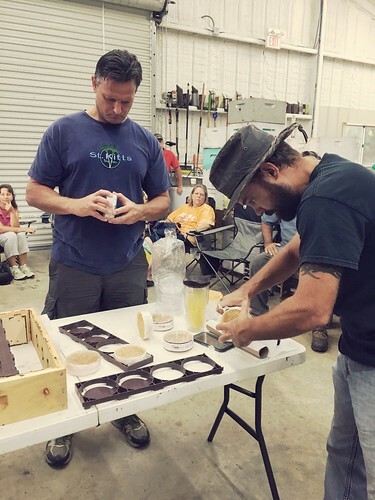 The beekeeper workshops Mark conducts on Saturdays he’s free have been awesome – what a great way for new beekeepers to meet each other and continue learning from one another. Last weekend we covered how to process Ross Rounds and of course we sampled for our guests – super fun! Join us sometime if you can. You can check all our social media for upcoming topics and other developments or you can just call us at 830-305-7925. Often I like to go out to the Honey House after work, or any chance I have. We both really love that we work and live on the same property so we can enjoy this luxury. I was intrigued by the lovely beeswax the bees had drawn out on this frame. We have pretty much run out of honey supers for the girls to fill up. 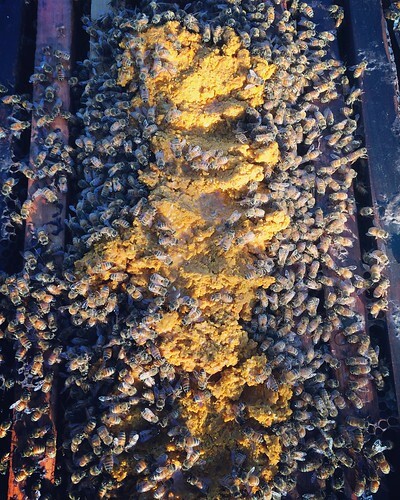 This happens when we have grown in the number of hives we have AND it is a good honey flow year AND the honey is slow to dry out so we can’t extract quickly in order to reuse the supers. If you don’t continue to provide adequate space (supers in this case), then you slow the girls’ productivity and essentially can miss out on prime honey making opportunities. We are taking this as an opportunity to just let our bees draw out some comb on more frames which will be useful in the future. Sometimes people say or ask how we feel about forcing the bees to make honey by continuing to put supers on. Mark, who has kept bees for over 30 years, told me that people who ask that have never likely kept bees or they’d know whether we provide the supers or not, they bees WILL make honey. That’s what they do. 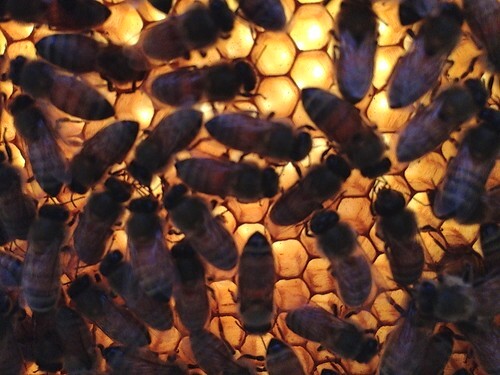 And it is a real mess when they don’t have adequate space in their home to store the honey. I am always learning new things when we discuss things like this and he is always good about answering questions that come up that I raise to his attention. He’s so busy tending to the bees as well as managing the business that he doesn’t see/hear all the social media, email and phone activities since I try to field those for him. 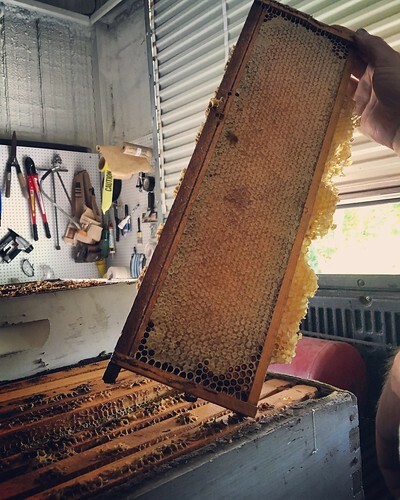 Back to honey-making…don’t worry, we are pulling some supers when possible but we are simply taking our time and letting nature take its course. Rushing never works great in the long run. Here’s a beautiful frame the men brought in last week. Do you like persimmons? I love them. Have you seen them in the wild? Out in a field in the middle of nowhere? On a ranch? On the side of some old dirt road you’re cruising to look for wildflowers or wildlife? Here’s another thing I learned about bees and how persimmons come into play. 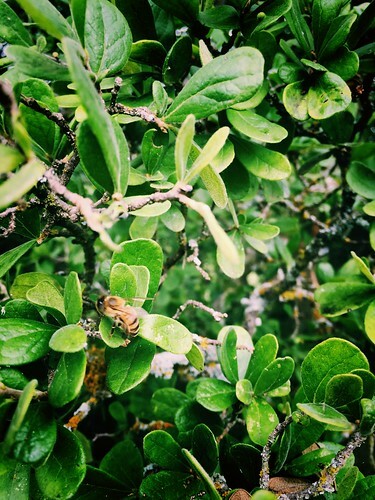 Have you ever noticed bees going to a wild persimmon bush or tree? But you look and think, hey, there aren’t any flowers right now. That’s odd. This happened here in our area a couple weeks ago. 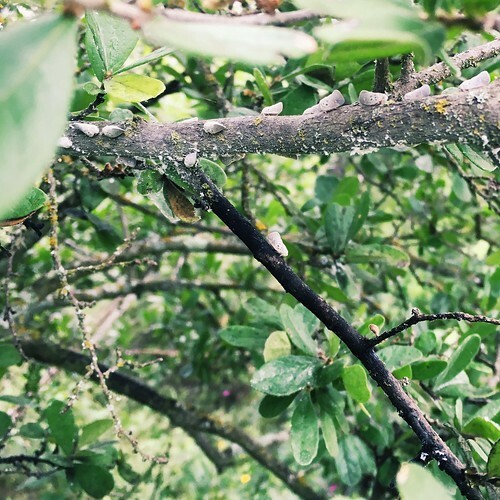 The wild persimmons had already bloomed out earlier this year and Mark knew that but saw bees on the big bushes so he took a closer look and watched patiently to see what the bees were doing. He took that picture for me and for us to share with you. Those are aphids and I missed them at first. He told me that the aphids secrete a honeydew on the wild persimmon bushes and that the bees must be gathering it. You can’t find a lot of writing on the matter but I read a post somewhere that people say they gather the honeydew there for different reasons – some say they do it when they are desperate while others say they collect it regardless of what else is out there because it’s just what they do. Whatever the case is, our bees were seen on the wild persimmons. 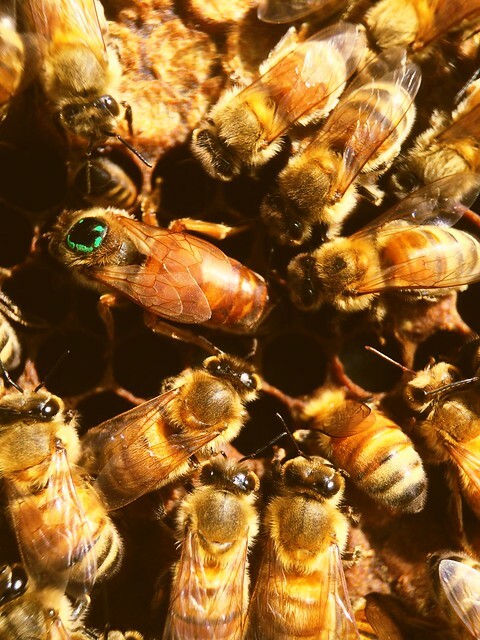 Good eye, honeybee! 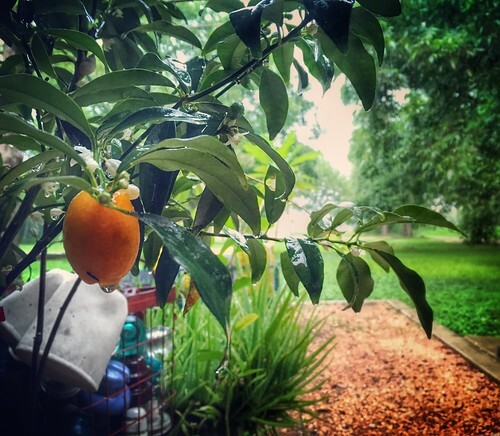 Well, I know I missed out on April but basically we have been getting April-and-now-into-May-and-a-little-into-June rainfall which means more greenery than usual for south Texas but it appears we are finally hitting our typical hot and or humid temperatures now. It’s okay. You just have to know it’s going to come and you accept it and wait for fall (if you are me haha). 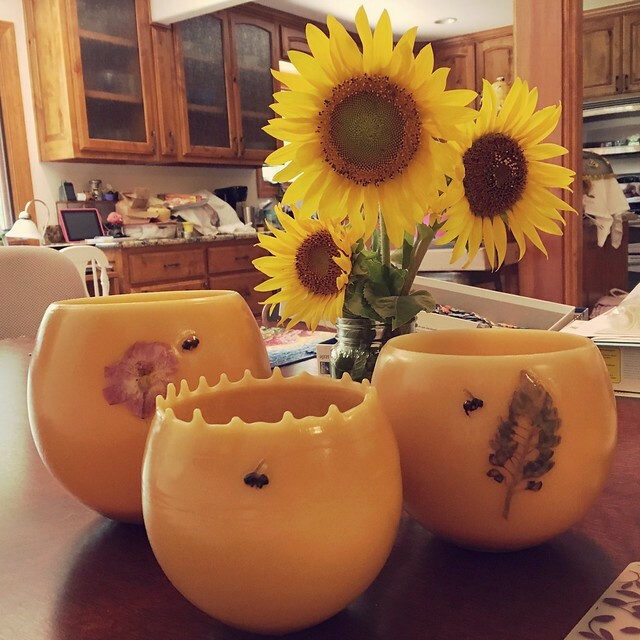 We have been doing well – having tons of fun fixing up the Honey House, stocking the Honey Store, creating and pouring awesome new products in the Candle Shop, seeing our family more…so much and all right here at the Bee Ranch. The bees are well, making honey and growing stronger. Not all of them but most of them. Being open to the public two days out of the week has been great – so fun to share what we love with folks on those two dedicated mornings. Saturdays have been so busy it’s truly amazed us both. We feel so blessed and so excited about the future. There are sooooo many ideas we want to pursue and we look forward to continuing to learn and do and enjoy. Well it appears spring is pretty much here to stay. That’s Agarita in bloom in the above picture. It’s a great early spring plant for the bees and they are all over it. Very awesome to see this. I was hoping for a little colder weather still as I do miss it even though I’ve been here 20 years and I know what to expect but I still hope for some crazy cold, long lasting winter. HEHE I know that’s not what the beekeeper might want and likely the bees wouldn’t either. Speaking of beekeeper, Mark continues to make his rounds to his bee yards, checking their statuses and feeding whenever necessary. Some hives are doing really well while others need a little help until the flowers really bust out. He’s also continuing his mite treatments as he continues to see mites in the hives. A follower on Instagram asked us if we do that preemptively or if we actually have mites and know it. I told her we have mites; we know it; most beekeepers, if not all, have them; and she’d be wise to start reading up on all the research out there on multiple treatments available. No one yet knows the best answer but it’s a raging topic and a debate at times among beekeepers and sometimes even with bee supporters who don’t know much about bees or this mite issue. I can’t tell you how often people judge beekeepers who opt to use ANYTHING UNNATURAL on the bees. We’ve now gotten to the point where we just tell folks that if we were really sick and had a palm-sized tick sucking the life juice out of us, please give us medicine and help us. We don’t want to die that way nor would we want to let our bees die that way. It’s a terrible issue and we will do what we can to help our girls. Okay, on to more positive news from the Bee Ranch and Seguin. 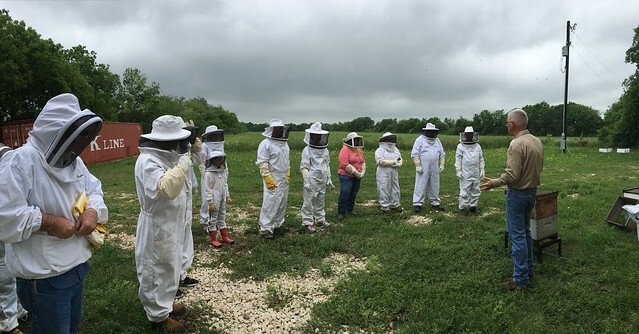 Overall and especially in Guadalupe County bee yards (this is the county where we reside so most of our bees are here), Mark’s been really pleased with how almost all the hives are looking at this point. 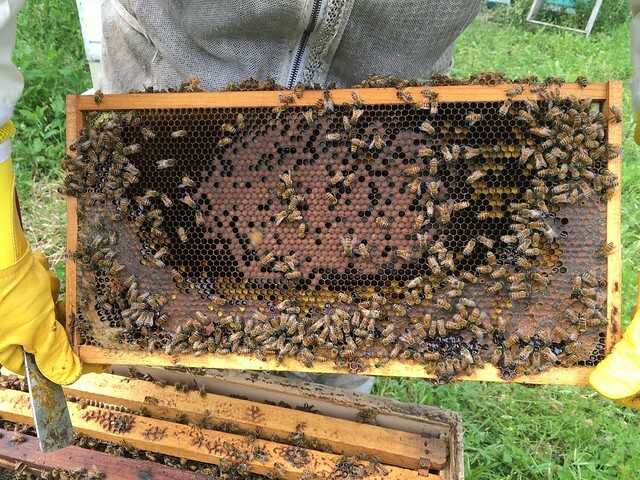 Strong hives with lots of bees, brood patterns starting to thicken, more and more pollen coming in and good looking queens. This may be the strongest he’s seen the majority of his hives at the end of winter and rolling into spring. We are very excited about this! Here are a couple of projects and developments that have us super excited. Beeswax lotion bars. I’ve been working on this formula for some time now and I think I may have it the way we like it. I’m so excited to get a label for this soon and start offering it! I am so in love with learning how to make these new products with Mark and making it for us, our family, friends, and soon our customers. 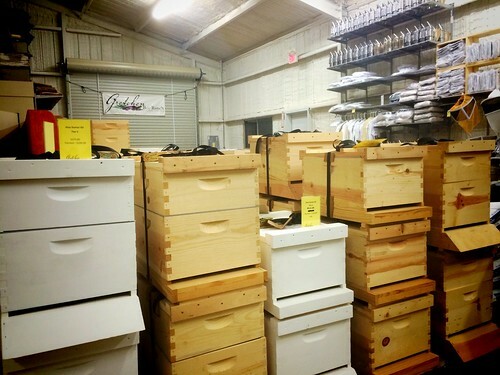 Our Bee Gear and Equipment retail area continues to grow and Mark is happy he can supply local folks with things they need to get started to get going. These fully equipment hive kits (three levels) have become quite popular now that spring is upon us and busy people just want to pick up the complete hive and not sorry about piecing it together, which they can do if they choose to here. It’s been a good learning experience but also a lot of work for Mark but if you know him, you know it also makes him happy to help people starting out in beekeeping. He’s a great teacher and mentor. 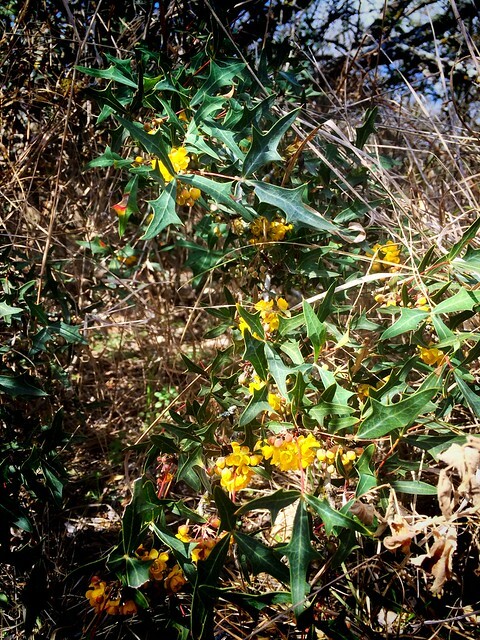 Check & Feed As Needed – Come on Wildflowers! While most of our hives are doing just fine and many actually having the best winter ever (since we started GBR some six or seven years ago), a few need some TLC. We fed sugar/water feed and or added a pollen patty supplement with our pollen and a little sugar water to make this paste. Should be enough hopefully to get the girls to the wildflowers and other blooming plants just about to come out. 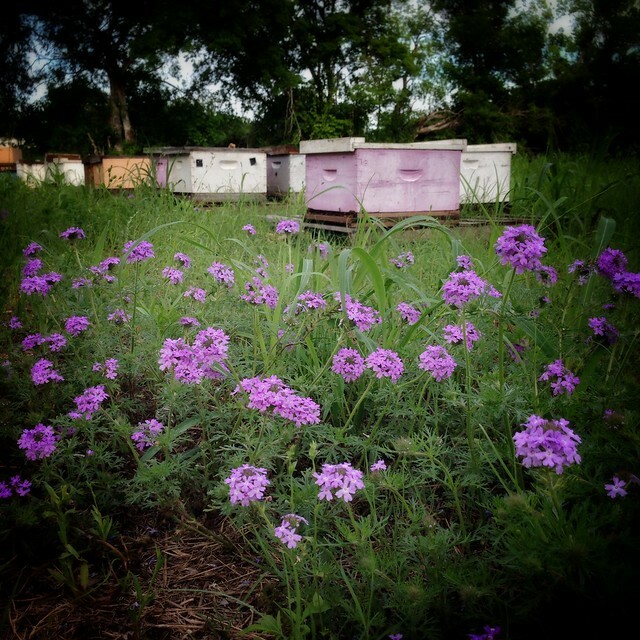 With about ten or eleven bee yards located across the area, we see different developments with our hives. It’s a good way to learn and practice different things Mark continues to read about. Meanwhile, I totally enjoy watching and shooting bee shots any and all the time. 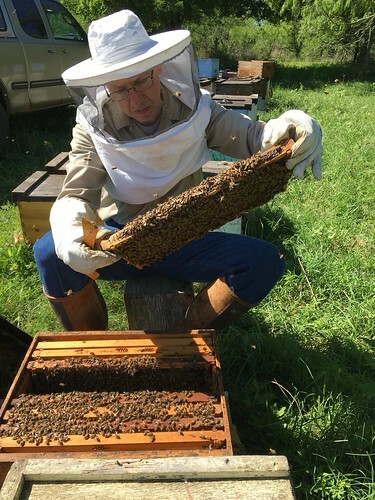 This was out at Elm Creek last week as Mark checked the hives and completed his mite treatments. 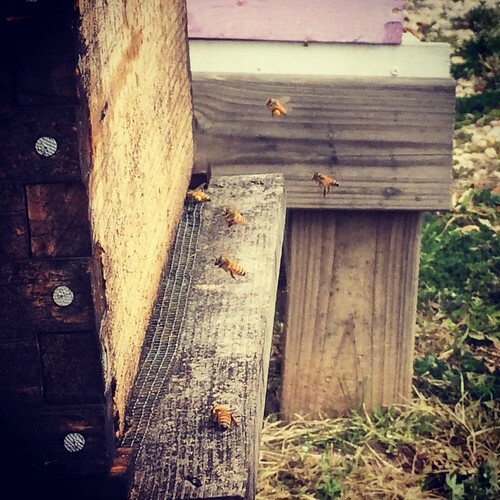 As we continue to experience growth with our bees as well as our business, the work day keeps stretching out longer and longer and then here we are in Spring already. We are happy to report that our wet winter is rolling right into a somewhat wet spring and things are about as green as we would expect to see when we visit family along the east coast. Lush grasses and trees along with a multitude of wildflowers everywhere you turn your eyes. 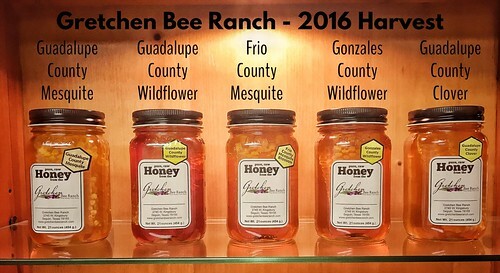 It truly is one of the best times to be in South Texas and certainly one of the best times to be a honeybee here. EXCEPT that if we don’t get a bit of good ole sunshine soon, it might end up not being a robust honey year. While rain is awesome, there is such a thing as too much of a good thing. 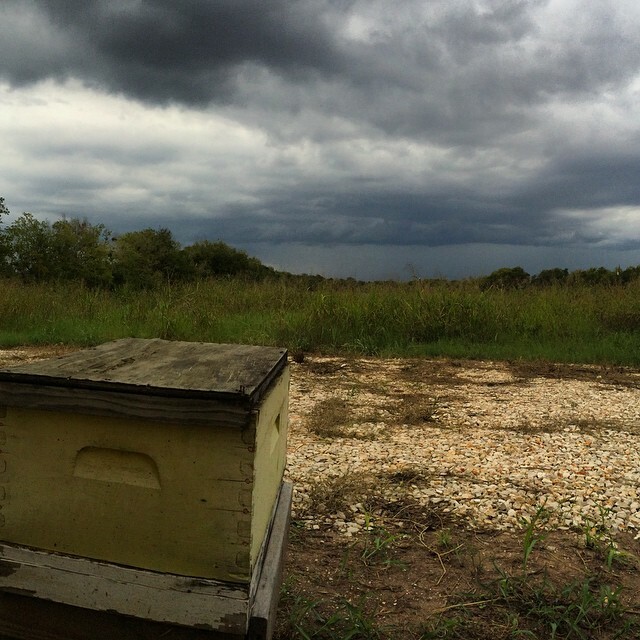 As Mark often says, conditions have to be just right for a great honey crop. We do need rain but the bees do need a good amount of dry, sunny days in order to fly and forage. There’s a noticeable gap recently in the wildflower blooming. We had massive ways of early Bluebonnets and Indian Paintbrushes and of course sprinklings here and there of other flowers, however, the Indian Blankets which normally appear abundantly are appearing more lazily this spring. That makes an incredible honey so we have hopes of a robust bloom in about a week. 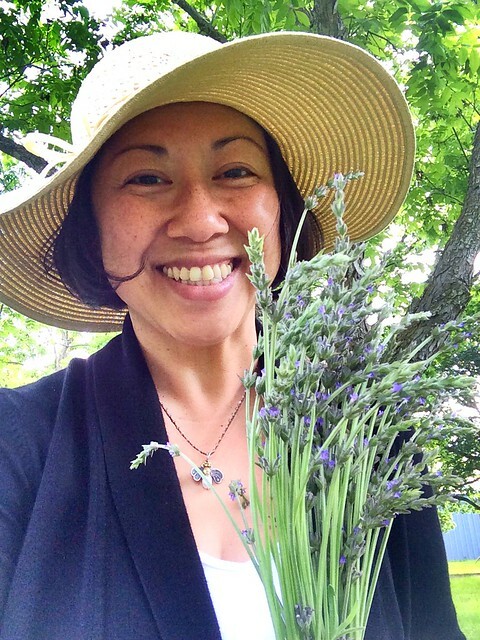 In the picture below, I harvested some lavender from our little herb garden out back. Lavender blooms abundantly only with rainfall (versus hand watering) so this is my SECOND harvest of blooms! That should tell you how wet this spring has been. I’ve never been able to harvest enough of it to do anything with the blossoms so this year I am very excited to enjoy them for a while before drying them out. They smile divine! I’m going to infuse some oil and make our own lavender oil I’ve been reading up on lately. 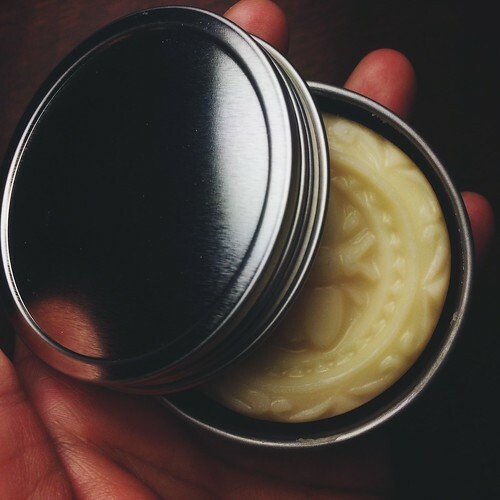 I think I will also try adding them to lip balm, which is next on my list of beeswax related items I’ve been developing for our personal use at this time. More on that in a bit. 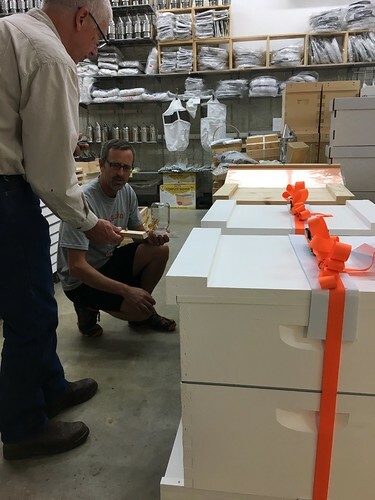 Today at lunch (one of our few quiet times we have together when we’re actually sitting down), Mark and I were discussing the move of our Cibolo Creek bee hives. We haven’t been there long but we liked it – close to home (just south of Seguin and just on the other side of the county line), made great honey, gorgeous landscape for photographs and just nature enjoyment. But recently we’d notice work getting done – fences going in, land getting cleared. We like to keep in close touch with our landowners so that we know what’s going on and how it might impact our bees. Long story short, we are very happy that two options may have presented themselves today to Mark. 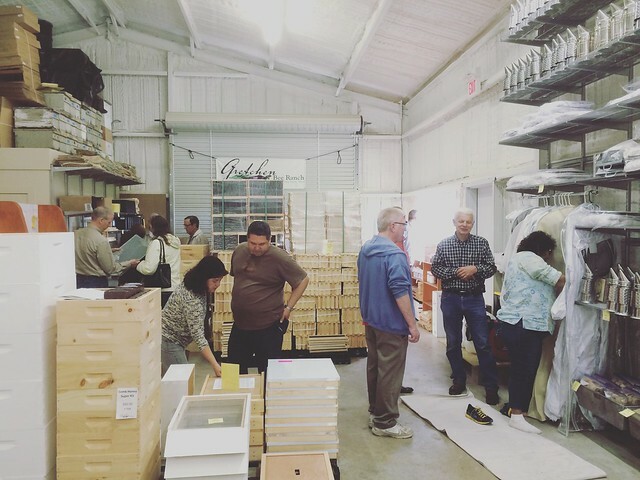 We’re so thankful when people meet with us to check out potential bee yard locations and it all happens to work out! Mark says the new locations are both near us so that helps with fuel cost as well as with time, which we find less and less available. Both weekend days are booked now with Pearl Farmers Market (which are both well attended and have been great for our business). Serving as president of the farmers market association has also taken up a lot more of Mark’s time than we anticipated so that’s been a real challenge. And while I can manage with the other social media platforms, it’s harder and harder to find time for an in-depth post on our beloved Bee Blog. So, forgive me. But honestly if you do have access to Tumblr, Facebook, Twitter or Instagram, do find us. I am on there daily as it’s just easier to post pictures as we work and add a short description. Stick with us! 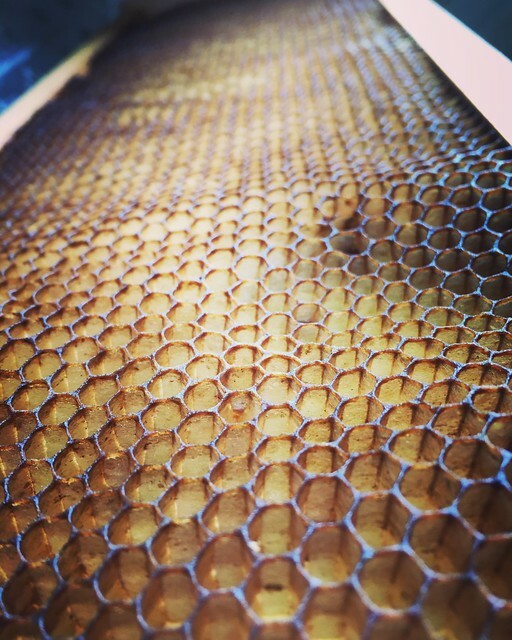 This is a shot of some of our new hives Mark made up from strong hives this spring. I don’t even know what our current count is anymore for our own hives, but it’s been really wonderful to have had this spring to focus on them.